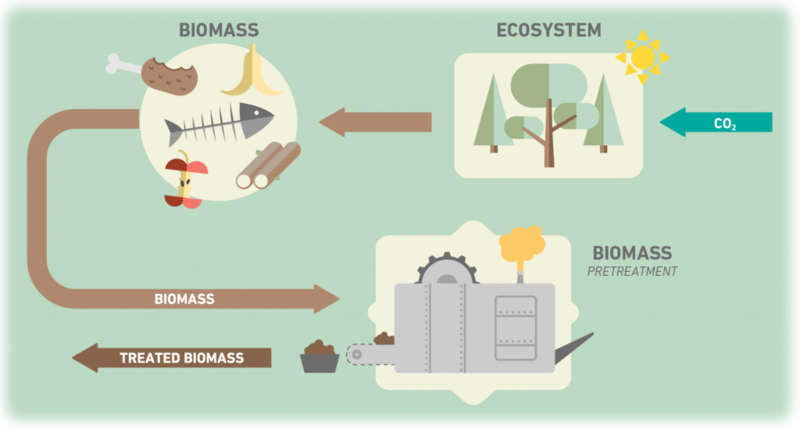 Before biomass can be converted to biofuels, typically a pretreatment is required to dry and reduce the size through shredding and grinding. After pretreatment, biomass is fed into the gasifier where it is converted into a synthetic gaseous fuel (syngas), mainly composed of hydrogen (H2), carbon monoxide (CO), methane (CH4), short chain hydrocarbons and other inert gases (such as CO2 and N2). Gasification takes place under shortage of oxygen and the processes may be distinguished according to the gasification agent used and the type of heat supply. Typical gasification agents are high purity oxygen, water and air. In autothermic processes, heat is provided through partial oxydation of the biomass by direct contact with oxygen. In allothermic processes, heat is provided externally via heat exchangers or direct contact with hot solids produced in a combustion reactor interconnected with the gasifier. 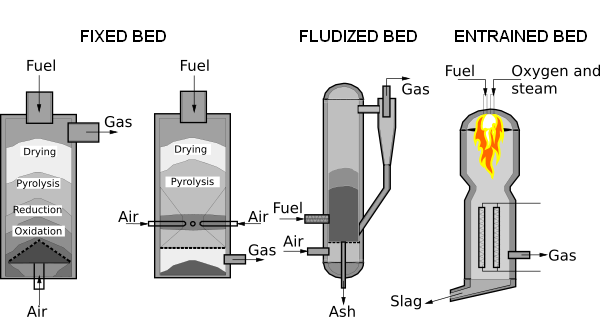 Fixed- or moving-bed gasifier, where relatively coarse solid biomass is gasified by the gasifying agent, while slowly moving downwards. Fluidized bed gasifier, where biomass and other solid materials are vigorously mixed by the gasifing agent. Entrained Flow Gasifier, where finely grinded solid biomass is entrained and quickly converted by the gasifing agent. After the gasifier, syngas has to be cleaned from impurities (particulate matter, tar, sulphur compounds, alkali and chlorine compounds). When syngas is used for the synthesis of fuels or chemicals, its composition has to be adjusted to meet specifications of the downstream chemical process. This is typically achieved through a water gas shift section (adjusting H2/CO ratio) and CO2 removal unit. More information can be found on European Biofuels Technology Platform (EBTP).